“Flesh off the CD plesses Ken “Intelnet Pastol-Teachel” Sirva will soon lerease his ratest cliticarry acraimed hit musicararbum, My Rife As Soopa Discelnmentarist” (Source: Discernmentalize Japan News Agency). “A tru mastapiece!”—Tokyo Times raves! 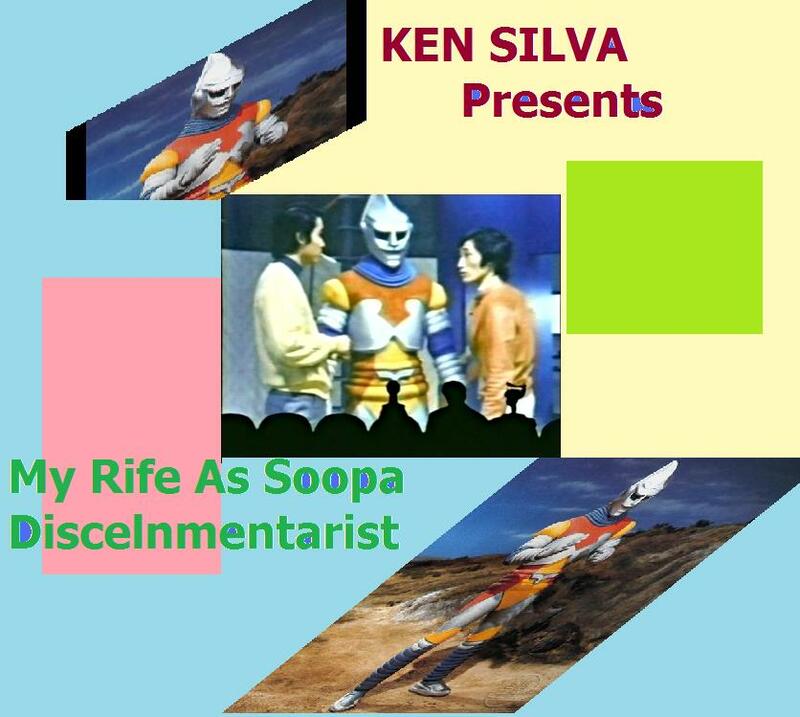 “Bigger than a Toyota and heartier than a pail full of sushi, Ken Silva’s newest album is truly larger than life,” says Osaka Records Corp.
OD Mafia inside source to all things Ken Silva, our very own Dr. I. Todyaso proclaims: “Ken has done it again by melding his dreams of being a rock star with his dreams of being top Discernmentalist with his newest album based on his adventures in Japan. This is sure to be a major hit till Armageddon comes in 2012—when the angry sovereign American flag waving warrior Jesus comes back in His full wrath to slay all those who didn’t participate in John MacArthur’s Truth Wars by pledging allegiance to John MacArthur and Todd Friel’s Angry American God of sovereign wrath and nuclear bombs.” Dr. Truthslayer, Arthur McJohn and I agree. KEN SIRVAS ? KEN SIRVAS ! P. S. Buy our new anti-science book! We need to harken back to the good ole days when school children prayed in rote (like Muslims) saying the Lord’s Prayer mechanically. Surely this preserved America! …where Bible & Guns went hand in hand, and we didn’t question foreign military conquests or the killing of poor peasants.These were the good ole days of true bible conservatism ….because conservatism is biblical and biblical is conservatism. During those good ole days when we had prayer in school things were better than today. People believed in old fashioned values like the Vietnam War….and killing gooks because good American Christians believed in such a thing. People believed that blacks should sit at the back of the school bus, and should not use the same water fountain (because we believed in one nation under a white god). Moreover, one nation under god meant the state religion of Christendom (just as the Second Book of Discernmentalism demands)…just like Rome where you could pretend to be a believe and get bestowed all sorts of rights and priveledges. Remember, James Second Epistle? Always be first in line and take the best seat, and use the state to enact your beliefs. 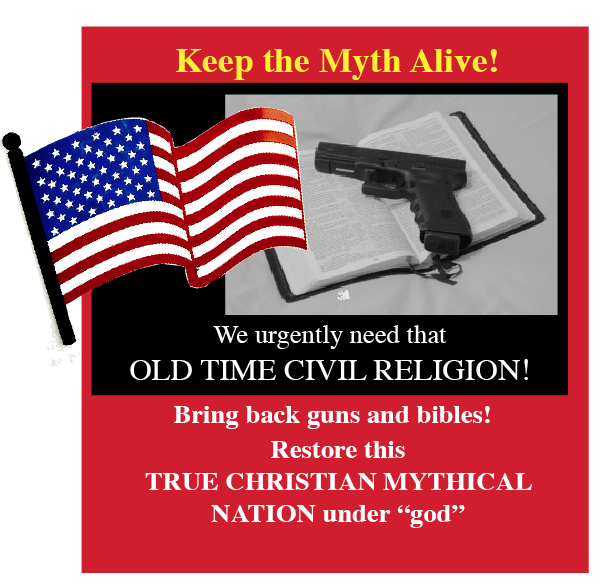 Let us get back to the bible-believing golden age! All true civil religionists unit! Get prayer back in school, make sure every student owns a gun and make sure they pledge allegiance to the one true God state. PS Please support theocracy and the Tea Party.